The aim of this work is to study continuous counter-current absorption of Volatile Organic Compounds (VOCs) by an oil–water emulsion. 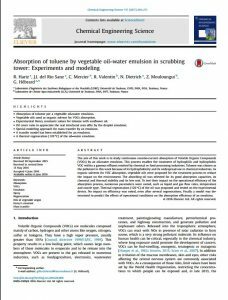 This process enables the treatment of hydrophilic and hydrophobic VOC within a gaseous effluent emitted by chemical or food processing industries. 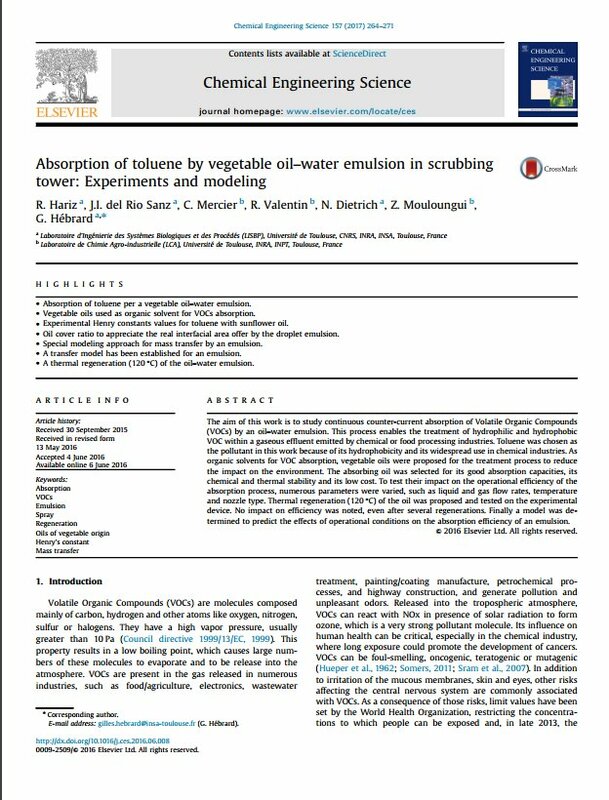 Toluene was chosen as the pollutant in this work because of its hydrophobicity and its widespread use in chemical industries. As organic solvents for VOC absorption, vegetable oils were proposed for the treatment process to reduce the impact on the environment. The absorbing oil was selected for its good absorption capacities, its chemical and thermal stability and its low cost. To test their impact on the operational efficiency of the absorption process, numerous parameters were varied, such as liquid and gas flow rates, temperature and nozzle type. Thermal regeneration (120 °C) of the oil was proposed and tested on the experimental device. No impact on efficiency was noted, even after several regenerations. Finally a model was determined to predict the effects of operational conditions on the absorption efficiency of an emulsion.